J. Lort Stokes : Swimming, Floats and Rafts, North West Australia, 1842. T. and W. Boone, London, 1846. Project Gutenberg - Sue Asscher, 2004. Stokes reports, without further detail, that "the raft they use is precisely the same in make and size on the whole extent of the North-west coast." However, in 1842 members of his ship encountered two aboriginal women with several children aboard a raft, "quite a rude affair, formed of small bundles of wood lashed together, without any shape or form, quite different from any we had seen before." Mid-way in crossing between the heads of the East Arm of Port Darwin ("Patterson Bay") of approximately three miles, the raft was propelled "by four or five men supporting themselves by means of a log of wood across their chests," a similar the methods of the mpadua and mpata of Lake Botsumtwi in West Africa. Stokes suggests that by identifying variations in the use of canoes, "some light may be thrown on the migration of the aboriginal inhabitants of Australia." He notes no canoes were "seen westward of Clarence Strait, in the bottom of the Gulf of Carpentaria, nor on the south coast." Finding are large number of aborigines encamped on Magnetic Island, Stokes was unsure of how they arrived, as there were no canoes to be seen. He concluded that a sandy spit connecting with the mainland "must be sufficiently shoal at low water to allow the natives to ford over." The Beagle left England in 1837 under the command of Commander John Clements Wickham, who had been a Lieutenant on the second voyage. 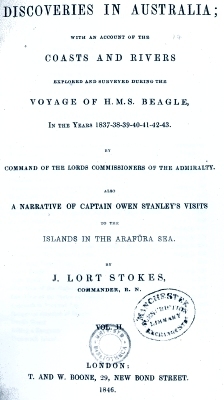 Lieutenant John Lort Stokes was the assistant surveyor, previously serving as a midshipman on the Beagle's first voyage and mate and assistant surveyor on the second. Charged with surveying large sections of the of Australian coast, they began at the Swan River (modern Perth) and worked north to the Fitzroy River (approximately Broome). After charting both shores of Bass Strait , the Beagle sailed north in May 1839 to survey the shores of the Arafura Sea opposite Timor. Stokes assumed command in March 1841, after Wickham resigned due to illness, completing the mission and returning to England in 1843. We were much struck during our stay by the contrast between the natives here, and those we had seen on the Beagle's former voyage at King George's Sound. The comparison was wholly in favour of those living within the influence of their civilized fellow-men: a fact which may surprise some of my readers, but for which, notwithstanding, I am quite prepared to vouch. A better quality, and more certain supply of food, are the causes to which this superiority ought to be attributed: they are indeed exceedingly fond of wheaten bread, and work hard for the settlers, in cutting wood and carrying water, in order to obtain it. Individually they appear peaceable, inoffensive, and well-disposed, and, under proper management, make very good servants; but when they congregate together for any length of time, they are too apt to relapse into the vices of savage life. Among the many useful hints, for which we were indebted to Mr. Roe, was that of taking a native with us to the northward; and, accordingly, after some trouble, we shipped an intelligent young man, named Miago; he proved, in some respects, exceedingly useful, and made an excellent gun-room waiter. We noticed that, like most of the natives, he was deeply scarred, and I learned from him that this is done to recommend them to the notice of the ladies. Like all savages, they are treacherous- for uncivilized man has no abstract respect for truth, and consequently deceit, whether spoken or acted, seems no baseness in his eyes. Soon after daylight we left this anchorage, whose exact position I mention, as it may be of use to some future voyager in these seas. The eastern of the three islands north of Roe's group was just open of the north point of the bight in which we lay, and a small rocky islet close to the shore bore South-South-West one mile; we had five fathoms at low-water in the bight, and twelve immediately outside. After making a stretch to the southward for about five miles, in soundings varying from 20 to 25 fathoms, we again closed with the shore, and anchored in five fathoms, on the south side of Roe's group, three miles from our former anchorage. A party landed in the afternoon to procure the requisite observations: the country was not quite so sterile, nor its face of so rugged a character. We found nothing worth particular attention, except a native raft, the first we had yet seen. It was formed of nine small poles pegged together, and measured ten feet in length by four in breadth; the greatest diameter of the largest pole was three inches. All the poles were of the palm tree, a wood so light, that one man could carry the whole affair with the greatest ease. By it there was a very rude double-bladed paddle. From a distant station I looked upon the dangerous and rapid current, which divides two rocky islands, and the perils of which are fearfully increased by the presence of an insulated rock in its centre, past which (its fury only heightened by the opposition) the torrent hurries with accelerated force. CHAPTER 1.6. POINT CUNNINGHAM TO FITZROY RIVER. On landing we found a fire still burning, near the beach, and beside it a bundle of the bark of the papyrus tree, in which were carefully packed a quantity of ground nuts, they were each about three-quarters of an inch long, and in shape not unlike a kidney potato;* it seemed clear, judging from the native value of the commodities thus rashly abandoned, that our arrival had rather taken by surprise these untutored children of the wilderness: we saw nothing of them till we had reembarked, when (four or five only in number) they returned to the beach; and we could perceive that our foot tracks, upon which they appeared to hold an animated debate, had, to say the least, mightily puzzled them. CHAPTER 1.7. THE FITZROY RIVER TO PORT GEORGE THE FOURTH, AND RETURN TO SWAN RIVER. Here for the first time since leaving the Fitzroy we saw native fires. One of them was upon an island eight or nine miles from the main, between which, however, a chain of smaller ones formed links of communication. These signs of inhabitants gave us hopes of finding some improvement from the almost utter sterility that had hitherto prevailed among these scattered islands. We had as yet seen no traces of either canoes or rafts, and therefore were not a little curious to see what mode of conveyance the natives of these parts used. But perhaps the most interesting discovery in this bay, was a native raft, which we found near the beach, in such a position as must have required the exertions of several men to have placed it there; being heavier than either of our boats. In the construction of this raft, almost everything had been left to nature. It was framed of the dead trunk of a mangrove tree, with three distinct stems growing from one root, about 18 feet long, and 4 1/2 broad. The roots at one end closely entwined, as is the habit of the tree, formed a sufficient bulwark at the stem, while an elbow in the centre of the trunk, served the same purpose at the stern: a platform of small poles, well covered with dried grass, gave a sufficient flooring to this rude specimen of a raft. I could not survey it without allowing my thoughts to carry me away in pleasing reflections upon the gradual progress of human ingenuity by the advance of which, the same intellect that first contents itself with the mere floating of the single tree, at length shapes a forest into timbers and launches the floating fortress in triumph on the deep! We were now about 40 miles in a direct line from Port Usborne, and perhaps 70 by the winding course we were obliged to follow; only two days' provisions remained, and as we were still deficient of material for the chart of this archipelago, I was reluctantly obliged to abandon the idea of attempting to reach Collier Bay. The mainland we had explored, since leaving Port Usborne, may be described as forming eight bays, varying in depth from three to eight miles, and in width from two to five; their general trend is East-South-East; many islets skirt their shores, and almost more than can be counted fill their mouths. We had just completed our surveying operations, when two of the boat's crew came to report a visit from one of the natives, and concluding others were at hand, hastened up to strengthen our party; they said their sable visitor came to them without any enticing, no offers of red or blue handkerchiefs, or some gaudy bauble that seldom fails to catch the eye of a savage- and without the slightest indication of fear. When I pointed to the fresh water, he said slowly and distinctly, "Yampee, Yampee." With the first grey of the morning we left Bathurst Island, on our return to the southward. Whilst passing inside the cluster of isles of slate formation, we heard a "halloa," and on looking in the direction from whence it proceeded, a native was observed on a raft: the boat's course was immediately altered so as to cut him off should he attempt to escape, but to my great surprise he paddled towards us with all possible haste. He was soon alongside, and with great satisfaction we at once recognized our strange friend of yesterday, who amongst the boat's crew, went by the sobriquet of Yampee. He again made use of the word Yampee according to our orthography, and after repeating it several times, I offered him some water, which he very eagerly accepted, twice emptying a canister that had originally held 4 pounds of preserved meat; this afforded me additional proof of Yampee being the word the natives of these parts use for water. At Swan River, the native name for water is gab-by, which differs so much as to lead us to suppose the dialect of the two places is quite distinct. This supposition is also borne out by the fact, that Miago, the native of Swan River we had on board, could never understand the language spoken by his countrymen, on the western shore of King's Sound. We found our new acquaintance as yesterday, perfectly naked, the raft he was on was in every respect similar to that previously seen upon Roe's Group, with this slight exception, that between each pole several small pieces of wood were inserted so as to make the flooring of the raft almost smooth. Into the large end of the centre, and largest pole, six long pegs were driven, forming a kind of basket in which were secured his means for procuring fire; they consisted of two pieces of white flint, and some tinder rudely manufactured from the inner bark of the papyrus tree. He used in paddling a short spear, sharp at each end, and struck the water alternately on either side; in this primitive manner he contrived to make way with a rapidity that astonished us all. He had two spears on the raft, besides the one he used for paddling; one of them was about 12 feet long, also pointed at each end, though not barbed; and a small stick, similar to that used by other natives for throwing at birds, and small animals. As well as we could understand by his signs, it appeared that he had been anxiously waiting our arrival, and had pushed off from the main to intercept the boat, on our leaving Bathurst Island. We threw him a line, and he immediately comprehended our intention, and its use, by at once making fast to the raft; an instance of confident reliance upon our good intentions, which reflected much credit upon the unsuspicious openness of his own character, and which I should have exceedingly regretted by any act of ours to abuse. Had not the distance and our scant supply of food, rendered such a step imprudent, I should have been very glad to have towed him to the ship. I really believe he would have trusted himself with us, for that or a much longer distance; but this could not be, and therefore, after endeavouring to make him understand that we should sleep some distance to the south, where there was a larger boat, alluding to the ship, we filled his basket with bread, gave him as much water as he could drink, and bidding him farewell, reluctantly cut him adrift: I shall not soon forget the sorrowful expression of his countenance, when this apparently inhospitable act was performed; it did not seem however to quench his regard for his new friends, for so long as we could see him he was hard at work paddling in our wake. I noticed that the beads given him yesterday were gone; this fact, coupled with the smokes seen during the day, satisfied me that he had friends in the neighbourhood, to whom I hoped he would report favourably of his new acquaintances; we had certainly endeavoured to obtain his goodwill. Towards the morning there was a South-East breeze which brought the thermometer down to 76 degrees; it generally ranged between 80 and 96 degrees. The large bay discovered on our way to the southward now became the point of interest, and as daylight closed in the boats were secured in a small sandy cove, just within its southern point, where there were several native rafts, constructed precisely in the same manner as those seen in King's Sound, from which circumstance we called the place Raft Point. Immediately over it was the high land first seen in coming down the bay; huge masses were rent from its lofty frowning crags, on which the rays of the setting sun produced the most grotesque figures. A beautiful stream of water fell into the sea, in leaping cascades, half a mile inside the cove. Several rock kangaroos were seen on the heights; and after securing observations with some early stars, for latitude, which placed Raft Point in 16 degrees 4 minutes South, we tried an experiment to get a shot at the kangaroos, by setting fire to the grass and small wood growing at the base, and in the interstices of the rocks. While our return to Swan River was thus baffled and delayed by the long and almost unbroken continuance of foul winds, it afforded some diversion to watch the countenance and conduct of Miago, who was as anxious as anyone on board for the sight of his native land. He would stand gazing steadily and in silence over the sea, and then sometimes, perceiving that I watched him, say to me, "Miago sing, by and by northern men wind jump up:" then would he station himself for hours at the lee-gangway, and chant to some imaginary deity an incantation or prayer to change the opposing wind. I could never rightly learn to whom this rude melody was addressed; for if anyone approached him near enough to overhear the words, he became at once silent; but there was a mournful and pathetic air running through the strain, that rendered it by no means unpleasing; though doubtless it owed much of its effect to the concomitant circumstances. The rude savage--separated from all his former companions, made at once an intimate and familiar witness of some of the wonders of civilization, carried by his new comrades to their very country, and brought face to face with his traditionary foes, the dreaded northern men, and now returning to recount to his yet ruder brethren the wonders he had witnessed- could not fail to interest the least imaginative. Yet Miago had a decided and most inexplicable advantage over all on board, and that in a matter especially relating to the science of navigation: he could indicate at once and correctly the exact direction of our wished-for harbour, when neither sun nor stars were shining to assist him. He was tried frequently, and under very varying circumstances, but strange as it may seem, he was invariably right. This faculty- though somewhat analogous to one I have heard ascribed to the natives of North America- had very much surprised me when exercised on shore, but at sea, out of the sight of land, it seemed beyond belief, as assuredly it is beyond explanation: but I have sometimes thought that some such power must have been possessed by those adventurous seamen who, long before the discovery of the compass, ventured upon distant and hazardous voyages. EXPLORATION OF THE SOUTHERN BRANCH OF THE ADELAIDE. Proceeding upwards, we met a party of natives about seven miles from the mouth, in a very pretty bark canoe, fifteen feet long, and about two deep. The bark was sewn together with much neatness, and it was altogether the most artistic piece of workmanship I had seen among the Aborigines of Australia. It was the last of that description we met with in this direction, for we did not find canoes in use with the natives to the westward of Clarence Strait, but only rafts, a fact alluded to in an earlier portion of the work. Their canoes, about thirty of which were hauled upon the beach, were from twenty-five to thirty feet long, and very narrow, with outriggers projecting ten or twelve feet from each side, and supporting a piece of buoyant wood to give stability. They carried one large mat-sail, but did not appear to sail fast. As soon as we had satisfied our curiosity on the beach, old Lomba led the way to the village on the crest of the hill. The ascent commenced close to the landing place by a flight of steps rudely formed by logs of wood laid across a narrow path cut in the hillside, which brought us to within forty or fifty feet of the summit. After which we had to climb two ladders, made of hard red wood richly carved, placed almost perpendicularly against the cliff. In a recess under the upper step we noticed four small idols that bore a strong resemblance to those of the South Sea islanders. We had also an opportunity of seeing the boats, which are built in great numbers from the excellent timber with which all the islands of this group abound. They are much used by the traders frequenting the Arru Islands, and were highly spoken of for their durability and speed. The boats we saw, though they varied considerably in size, were all built on the same plan, having a considerable beam, a clean entrance and run, a flat floor, and the stem and stern post projecting considerably above the gunwales. They were all built of planks cut out of solid timber to the form required, dowelled together by wooden pegs, as a cooper fastens the head of a cask, and the whole afterwards strengthened by timbers, lashed with split rattan to solid cleats left for the purpose in each plank, during the process of hewing it into shape. Four of the smallest of these boats were purchased for the use of the colony, for about 2 1/2 dollars each, and were found to answer very well. A sandy spit connects Magnetical Island on the south side with the main, and must be sufficiently shoal at low water to allow the natives to ford over; for we found no canoes with those we met on the island, who were numerous and apparently very well disposed. Although not a large race, they were in very good condition; part of their food, is the native yam, called warran in Western Australia. The birds on the island are common to other parts; and the wallaby, of which Mr. Bynoe shot three, are light coloured. In the morning we found that the island was occupied by a party of natives from Torres Strait. Their canoes, which were furnished with outriggers, were hauled up on the beach, and their spears were deposited in the bushes around, ready for immediate use; but, although they seemed to suspect our friendly intentions towards them at first, no disturbance occurred, and some were prevailed upon to come on board. They instantly recognized the drawing of a Murray Island canoe, in Flinders' Voyage, and constantly kept repeating the word toolic, meaning iron, in the Murray Island language. Some light may be thrown on the migration of the aboriginal inhabitants of Australia, by tracing the parts of the coast on which canoes are in use. By the assistance of these and similar facts, we may hereafter be enabled to discover the exact direction in which the streams of population have flowed over the continent. But I am not prepared to agree entirely with Mr. Eyre when he concludes, as I have stated, from the fact of the rite of circumcision having been found on the south and north-west coasts, and on the Gulf of Carpentaria, that there exists any peculiar connection between the tribes inhabiting those several points. This enterprising traveller moreover thinks that the idea he has started goes far towards refuting the theory of an inland sea, another presumption against which he maintains to be the hot winds that blow from the interior. [Footnote] *An inference may be drawn from the parts of the shore on which canoes are in use, to show that the migrations of the natives, so far southwards, have been along the coast. After completing the survey of the southern and western portion of this harbour, we returned to the ship, where soon afterwards Captain Wickham also arrived, having found Patterson Bay to be a good port. It trended in south ten miles, and E. S. E. the same distance, forming quite an inner haven, which was name after Mr. Bynoe. At the turning leading from the outer to the inner harbour they came suddenly in view of a raft making across, a distance of three miles, on which were two women with several children, whilst four or five men were swimming alongside, towing it and supporting themselves by means of a log of wood across their chests. On perceiving the boat they instantly struck out for the land leaving the women on the raft. For some time the latter kept their position, waiting until the boat got quite near, when they gave utterance to a dreadful yell, and assuming at the same time a most demoniacal aspect, plunged into the water as if about to abandon the children 'to their fate. maternal affection was strong within them, and risking all to save their offspring, they began to tow the raft with all their strength towards the shore. This devotion on the part of the women to their little ones, was in strong contrast with the utter want of feeling shewn by the men towards both mothers and children. Captain Wickham now, no doubt to their extreme consternation, pulled after the men, and drove them back to the raft. Some dived and tried thus to escape the boat, while others grinned ferociously, and appeared to hope, by dint of hideous grimaces - such as are only suggested even to a savage by the last stage of fear - to terrify the white men from approaching. At length, however, they were all driven back to the raft, which was then towed across the harbour for them; a measure which they only were able to approve of when they had landed, and fear had quite subsided. Doubtless, the forbearance of our party surprised them, for from their terrified looks and manner, when swimming with all their strength from the raft, they must have apprehended a fate at least as terrible as that of being eaten. The raft itself was quite a rude affair, being formed of small bundles of wood lashed together, without any shape or form, quite different from any we had seen before. deep creeks branching off between N. E. and S.E., the largest of which led into fresh water, but in small detached pools, which seperated from the salt, by a shelf of red porous sandstone, and which; two miles further became entirely lost in the rocks. The green appearance of the gum-trees and occasional clump of palms, which had pleasingly succeeded the mangroves, as they advanced, assured Captain Wickham that there was fresh water near. Probably, if they had carried their researches further, they would have found these signs reappear again, the presence of which the reader will recollect I inferred from seeing the ibis flocking from the south-west up the south inlet in Port Darwin; the west inlet of which is only one mile distant from the north-east creek in the head of Bynoe Harbour. Doubtless when the country is not in its present parched and thirsty state, all these are fresh at their heads. Geoff Cater (2013-2014) : J. Lort Stokes : Swimming, Floats and Rafts, NW Australia, 1842.